South Bend, Indiana Mayor Pete Buttigieg is competing for the 2020 Democratic presidential nomination. If elected, he would be the first openly gay and youngest president, and he’s supportive of marijuana legalization to boot. While the candidate has not spoken extensively about cannabis reform, nor did he act on any marijuana legislation during his time in the mayor’s office, he has commented that he supports efforts to end prohibition, which he views as a social justice issue. Here’s a look at where Buttigieg stands on marijuana. As mayor, Buttigieg does not appear to have signed legislation directly related to marijuana. He did, however, approve an ordinance in 2017 that prohibited businesses in the city from selling synthetic cannabinoids. Compared with most of his Democratic opponents, Buttigieg has seldom talked about cannabis policy. That said, when asked about marijuana legalization, he consistently speaks favorably about pursuing reform. Buttigieg also said that he believes voters in his home state of Indiana, which doesn’t even yet have a comprehensive medical cannabis law, are ready to legalize marijuana. During an interview on the radio program The Breakfast Club, Buttigieg brought up criminal justice reform and stressed the importance of supporting individuals who are released from prison for non-violent drug offenses as the country moves toward ending the war on drugs. Buttigieg’s most extensive public comments about marijuana are related to his own personal experience with cannabis and law enforcement and, specifically, how it shed light on the concept of white privilege. During an interview at South By Southwest, the mayor talked about how he was caught with a joint while a student at Harvard University. “At exactly, precisely this instant, a police car drives by—university police—and I thought, well, that’s gotta go over the shoulder,” he said. The officer apparently berated Buttigieg, swearing at him and calling Harvard students arrogant. But there was also an unfunny lesson to be learned, which has informed Buttigieg’s position on cannabis reform. He also said that the odds of him facing more serious, lifelong consequences over the joint would be much greater if he wasn’t white. 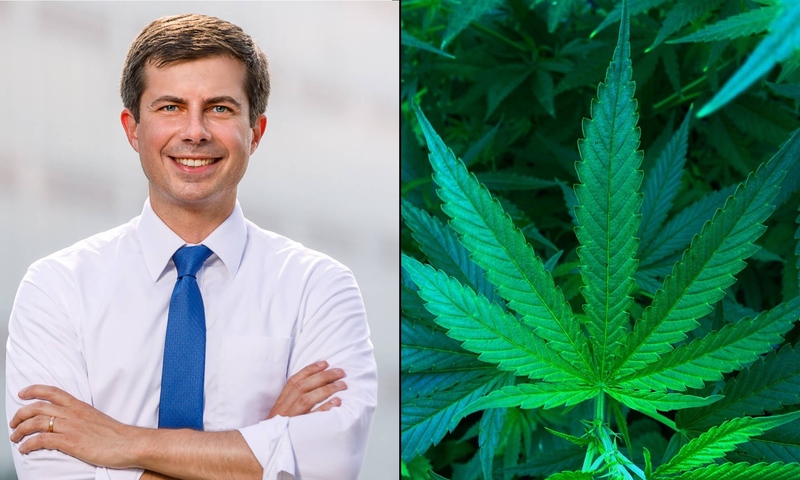 Without a legislative history on cannabis reform or comprehensive statements laying out his policy position on the issue, it’s difficult to say how Buttigieg would approach marijuana as president. Of course, his stated support for legalization and recognition of the racial injustices of prohibition indicate that, at the very least, he wouldn’t obstruct efforts to change federal cannabis laws—and may in fact embrace them. But at this point there are no indications that marijuana reform would be a priority issue for Buttigieg, however.